Vaping devices heat cannabis to a temperature in which the mind-altering compounds in the plant are released as a vapor that is inhaled. Vaping is thought to be safer for cannabis and tobacco use because it doesn't produce many of the harmful components of burning material such as tar and other cancer-causing agents. But, the researchers say, their study suggests that at least for first-timers or others who don't use cannabis regularly, vaping delivers greater amounts of THC, the primary intoxicant in cannabis, which increases the likelihood of adverse reactions. "In light of increased legalization of cannabis, we designed our study to be more representative of the general population's exposure to cannabis, namely someone who has never smoked it and wants to try it for medical or recreational purposes, or someone who does not use it regularly enough to understand or predict its effects," says Ryan Vandrey, Ph.D., associate professor of psychiatry and behavioral sciences at the Johns Hopkins University School of Medicine. "What our study suggests is that some people who use cannabis infrequently need to be careful about how much cannabis they use with a vaporizer, and they should not drive, even within several hours after use. It could be dangerous for themselves and others, and on top of that, they may experience negative effects such as anxiety, nausea, vomiting and even hallucinations," he adds. For their study, the researchers chose 17 volunteer participants (nine men and eight women, average age 27 years), who hadn't used cannabis in the past 30 days, which was verified by a drug screen, and together on average hadn't used in over a year. In a controlled setting at Johns Hopkins Bayview Medical Center's behavioral pharmacology research unit, each participant either smoked or vaped cannabis containing 0, 10 or 25 milligrams of Δ9-tetrahydrocannabinol (THC), the active component in cannabis that gives people the high, in single visits once a week over six weeks. The researchers say that 25 milligrams of THC is a relatively low dose, and much less than is typically found in pre-rolled cannabis "joints" sold in dispensaries where cannabis is legal. The participants either smoked preloaded pipes or inhaled vapor from a vaporizer. Neither the participants nor the researchers knew the doses of THC that were delivered in a given experimental test session. Each participant also completed the Drug Effect Questionnaire—rating self-reported drug effects out of a score of 100—shortly after smoking and each hour for up to eight hours later. The survey assessed overall drug effect; feeling sick, anxious, hungry, sleepy and restless; and experiencing heart racing, dry mouth, dry eyes, memory impairment and coughing. Results showed that a few minutes after smoking, those who vaped the 25-milligram THC dosage reported an average of 77.5 on the overall strength of the drug's effect, meaning how high they felt compared with the average score of 66.4 reported by those who smoked the same dose. Participants who vaped 25 milligrams of THC reported about a 7 percent higher score on average for anxiety and paranoia, compared with people who smoked the same amount of the compound. Those who vaped any dose of THC also reported higher levels of dry mouth and dry eyes than those who smoked it. For example, when vaping 25 milligrams of THC, the participants rated dry mouth at 67.1 on average compared with 42.6 for those smoking it. 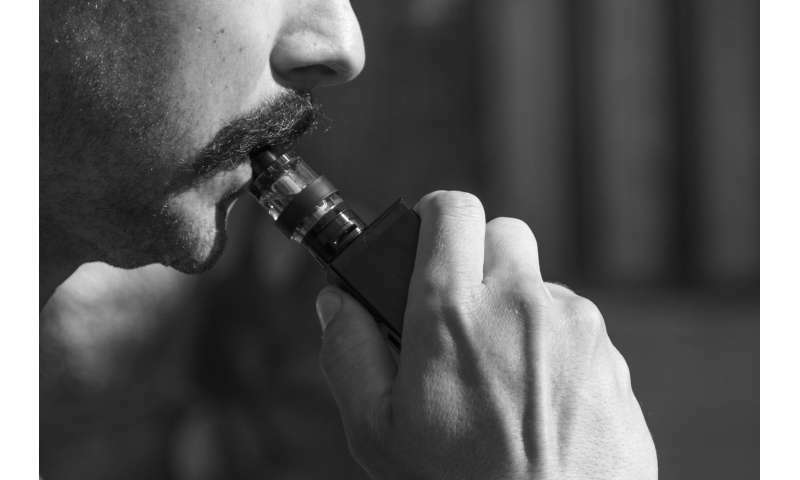 "Our participants had substantially higher impairment on the tasks when vaping versus smoking the same dose, which in the real world translates to more functional impairment when driving or performing everyday tasks," says postdoctoral fellow Tory Spindle, Ph.D., a researcher in the behavioral pharmacology research unit at Johns Hopkins Bayview. "There's a definite differences in the amount of drug making it into the blood when using a vaporizer versus smoking the drug, so considerations need to be made when dosing to ensure people are using cannabis safely," says Spindle. The researchers note that they could only detect THC in the blood samples up to four hours after using, even though the participants reported the drug's effects lasted five or six hours. The researchers say this suggests that blood testing isn't an accurate way to tell if someone is high or perhaps driving under the influence. Vandrey cautions that the study involved only a small number of younger adults and lasted only six weeks. "We still don't have a full look at the long-term effects of vaping, such as whether there is a risk for chronic bronchitis, and more work needs to be done on that front," he says. It is important to note that these effects were observed in individuals who don't use cannabis very often, and may not extend to people who use cannabis routinely; they may have developed tolerance to these effects and also may be better able to regulate their dose. In recent years, Canada and several U.S. states including Washington, California, Colorado and Massachusetts have legalized cannabis for recreational use. Thirty-two states have made cannabis available with a doctor's prescription, including Maryland, where the research was performed.